They aren’t bad buttons, they just don’t look quite right. Genuine horn, apparently. I think they look much nicer. The others were just that much too light. In the store, it came down to these horn ones, and some shell ones. The lady in the store really liked the shell buttons. Because of the reflective surface, they picked up the red, and there is a shell pattern along the cuffs. I almost went with those, but at the last minute decided they were too shiny. I think I like my choice. 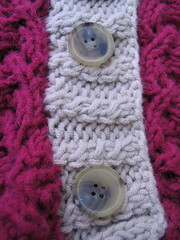 I also took a sleeve of the $1.50 cardi, to check out some buttons for that project. Found some gorgeous ones. I realised when I got there that I just had the sleeve, and no pattern, so I didn’t know how many or what size to get. Then the lady pointed out I could just pick ones I liked, and then make as many button holes as I need. Smart knitting lady. They’re rustic and wonderful. And more than I’d ever expected to pay for buttons, so I only got 4. 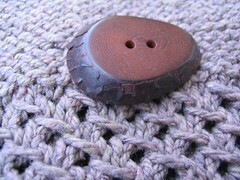 The store has a whole range of these buttons, not a size range, but a colour range. They all have the dark brown bark around the edge, but the inside can be blue, green, red, orange, the natural I bought, and I think a few other colours. 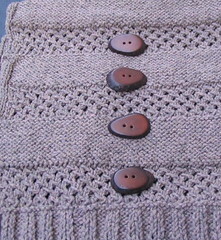 I was very tempted by the green, but the brown buttons will make the final sweater more wearable, I think. Then I came home and sat down to finish my Monkey sock. I think it is a tiny bit long. 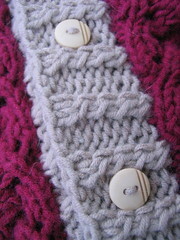 You can start the toe on either row 1, 10, or 11 of the pattern. I started on 10 (well, 9) but I think row 4 or 5 would have been perfect. It’s not too big, and this way it’ll fit perfectly once I’ve washed it. As soon as I had grafted the toe, I put it on the scale. Finished sock = 1.7oz. Leftover yarn (for sock #2): 1.8oz. Hurrah!! For the record, that was with only 1/2″ of ribbing, and 5 (instead of 6) leg repeats. 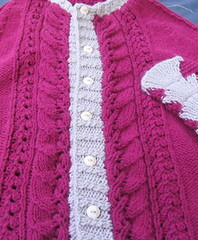 This entry was posted in Knitting, Socks, Sweaters and tagged dollar and a half, monkey, rambling rose by rycrafty. Bookmark the permalink. You are SO inspiring me! I have both of those in my queue (which is ever expanding these days). I am terribly in love with your button choices! They are going to look so great on!! 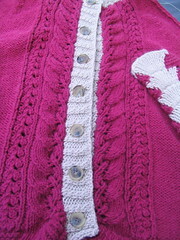 I LOVE the buttons you chose for the $1.50 cardigan. They go great with the sweater. Beautiful.